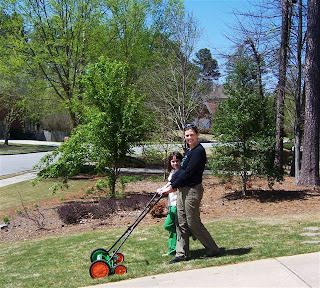 TWO pics of my daughter, Madeline, and I celebrating earth day! first pic, we're recycling! we recycle just about everything in our house....but especially our frappachino cups!! yum! second pic, we always use our favorite eco-friendly bags when shopping! super easy to bring and large enough to carry just about everything! love your tees, love this idea of celebrating earth day! Lily loves to go with my husband and me to bring in the recycled newspapers, boxes, and plastics each week. We recycle as much as we can. We have been wanting a Radio Flyer wagon for about a year. On Earth Day this year, we got one! And the one we got is the Earth Wagon. 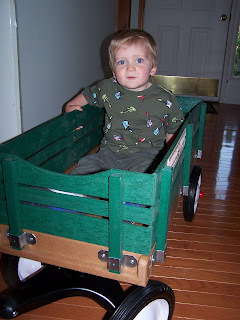 The body of the wagon is made from over 200 recycled plastic milk jugs! We were able to get what we wanted, keep junk out of the landfills, and as Little Man gets older we'll be able to us it as a tool to talk about recycling. New Tradition after the snow melted in Central Minnesota! 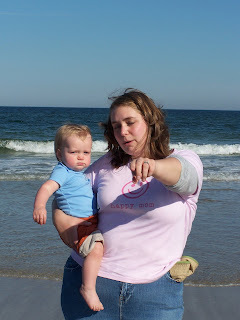 PLM, you've inspired our family to start a new tradition this Earth Day, 2009! Our first-grader, Megan, has always been a great helper with our recycling. She was really excited about helping the Earth this year by cleaning up a couple parks now that the snow has melted. Here in central Minnesota we had at least a couple feet of snow on the ground this winter. Once it melted you could see all the trash that had been blown around by all those winter storms. Life in Madrid presents ways to be green everyday. I walk my boys to school everyday and along the route we pick up trash. We actually pick up trash everywhere we go. Today, these pictures are from when we walked to the park after school. Dia de la tierra here in Madrid was the first beautiful day we've had in weeks. So, it was fun to walk and pick up trash at the same time. My five year old, Ryan, took most of the pictures. And Adam my (almost) 3 year old and Logan my 18 month old boys love to help mommy put the trash in the trashcans! Hope you enjoy these pictures. Happy Eearth Day or Feliz Dia de la tierra! We decided to take a walk and collect trash around our neighborhood. It was nice to teach him about doing something good for the earth and make our own neighborhood a little bit prettier! Happy Earth Day! I'm a "lucky mom" and a lucky preschool teacher. To celebrate Earth Day at Preschool, I showed my children the importance of recycling. I showed them what kinds of things they can recycle, and what the recycling sign looked like. It's amazing how much they already knew about recycling! Maybe there is hope for our future! Making Kites Out of Old Grocery Store Bags! To celebrate Earth Day at our school, I showed my students how they can make different things out of recycled items. We made kites out of old grocery store bags! They had a blast running around flying their recycled kites! Today the school celebrated Earth Day. The children were able to do many interesting and educational activities that had to moved indoors. The picture is of me and my 4 year old daughter Isabella doing activities together at school. She is holding her garden in a glove. I was able to help the children with the Earth Day activities today. Tomorrow they plan to plant some things outside if the weather holds up. Hi, Peace Love Mom! I'm here with my two Energy Star helpers, We start by changing to 13 watt bulbs around the house. It's the easiest thing you can do and will have the biggest impact on your bill! We will stay committed to the environment. Saving Energy- It's not just the Smart Thing to do... It's the Right Thing to do. Mom Dena with her 3 sons: Jack, Luke and Mark. We are admiring the tulips we planted in the fall that are now blooming. 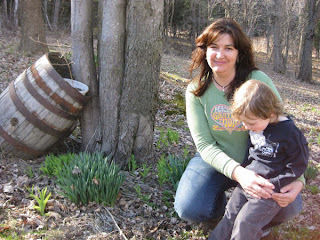 To celebrate Earth Day, my son River and I checked out all the daffodils that are starting to come up in our yard. A welcome sight after a long, cold Vermont winter! Susan, Natalie and Sallie Kate help the environment by recycling plastic bags. My kids and I picked up trash from the beach over Spring Break. Thanks for the motivation to do it! Our Earth Day Contribution is that we planted a garden. Garden's are pretty to watch grow, clean the air and will provide for food our family. Going Green with a Push Mower! Last weekend I bought and assembled (with a little help from my husband!) a Scott 20" push hand mower to be green and not have a noisy, gasoline using lawn mower and I wore my favorite PLM shirt! My daughter, Nora, age 8 helped me take it on its first spin around our yard. I have a neighbor who persuaded me to go "green" and it's great to lose the lawncare bill in the summer months and it's really easy to use! Plus, we have people talking-I think this might be the start of a new trend! Recycling to help our Earth! Here's a photo of me recycling to help our Earth! 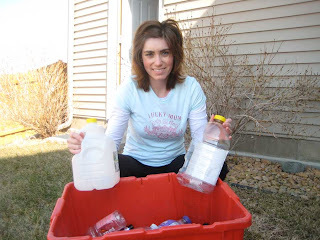 Our family recycles all plastic and glass containers to help make our Earth a more beautiful place! We made the switch to cloth diapers 9 months ago, and my 3-year-old loves to help change her baby sister's diapers. I was a little unsure at first, but now it is just a normal part of our routine. It feels great to know we have significantly reduced the amount of trash our family generates on a weekly basis. Clearly that baby loves her cloth diapers & her big sister is sooooo excited to help. No wonder Mom and her girls are so Happy! Helping save our planet Earth-one tree at a time! My 4 year old son,Brock, and I planted a tree. We believe that trees have a very significant place here on earth. We plan on planting many more, and anyone can plant a tree. The earth will thank you! Not to mention the birds, squirrels, bugs, etc. Happy Planting! What do Rolling, Recycle, and Road have in common? This is my little one Logan and me taking out our weekly recycling. We recycle everything we can from home. He loves rolling the recycle bin out to the road to be emptied! We are fairly new to recycling and it just amazes me how much we throw in the trash without thinking it could be recycled or reused. I pay attention now to everything that goes in the trash. It really does make a difference! Saving the Future & Saving for the Future! We go green to save for Addie's education. Shortly after Addison (a PeaceLoveBaby) was born in September we started recycling cans and saving the money we make to put in her college savings account. As Addie grows, so will her savings account and knowledge of recycling! Help make the earth a better place by reading! My five kiddos and I are doing one of the things we love to do that helps make the earth a better place: READ! We have a great personal library of books that help teach the children (and parents!) ways to make better "green" choices and what happens to our planet when we don't. Some of our favorites are: "The Secret of Water: For the Children of the World by Masaru Emoto," "A Hot Planet Needs Cool Kids: Understanding Climate Change and What You Can Do ABout It by Julie Hall," and "My Bag & Me: Save a Bag, Save the Earth! by Karen Farmer." Way to expand on the "R"'s we already think about. It is now recycle, reclaim, reuse and READ!! Love it. We use our reusable Ecologie bags everywhere we go, not just the grocery! We use them for everything! We proudly haven't brought home a plastic bag in months since we started using these. Everyone in my family also owns a Klean Kanteen like the one pictured by my 20 month old. He's had his since 12 months and prefers it to the plastic ones, hands down! My older son takes his to school everyday. We agree! In fact, You have inspired us to create a PeaceLoveMom reusable Ecologie bag! That will be a great GWP for this Summer..
We let each of our children pick out a tree to plant. My son picked out a Pear tree and my daughter picked a Cherry tree. They both helped plant them and will be providing water for them. I thought it would be neat for them to see the tree grow, providing us fruit as they grow up. We are also planting a square foot garden to grow organic fruits and vegetables. They are helping us get the soil ready and will help us plant the seeds & take care of our garden. These practical things teach them to take care of our earth and be responsible. Jennifer - You are really bringing true meaning to "Green". 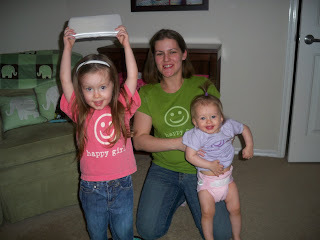 We can't wait to see your next PeaceLoveMom photo - you in your Happy Mom green tee, your beautiful children, and the growth of your garden. Thanks for making a difference. Hello! I am a mother of two and love to be "green" any way I can. I try to recycle as much as possible. Here is a picture of my two boys, ages one year and two years, and I recycling newspapers, our milk cartons and plastic bottles. I know that if everyone recycled just a tenth of their newspapers we could save approximately 25 million trees each year. If we recycle plastic bottles that saves twice as much energy as burning it in an incinerator. Although my children are young its not too early to teach them that we throw our newspapers, plastic bottles, milk cartons, etc. in the recycle bin. Courtney - Thanks for sharing your knowledge and for your Do & Tell. Your family is clearly "doing" and we can all breath easier because of it. Jennifer - Great ideas! Thanks for sharing. We love all words that start with "R" - reuse, recycle, reclaim and remember to teach at an early age. Thanks for reminding all of us.